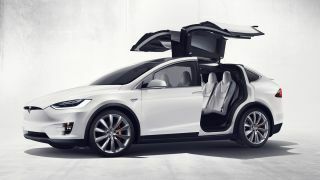 After launching the Model X, Elon Musk has been busy retweeting articles about the new Tesla car, which comes with falcon wing doors and a 'bio-weapon defense' system. This bio-hazard button activates an advanced air filtration system in the Model X, which Tesla says can filter out bacteria, viruses, smog and allergen, filling the car's cabin with "medical-grade" air. Gizmodo, however, spoke to a couple of "bioweapons expert," who have questioned the capabilities of the Model X's bio-weapon defense system, in particular the filtration system being able to capture viruses, which are typically much smaller and more difficult to filter. In what we presume to be a response to this, Elon Musk tweeted, "Model X Bioweapon Defense Mode definitely filters viruses btw, even the small ones." "Has hospital operating room level filtering," he added. Of course, we don't actually think (and also hope) we'll find ourselves in a situation any time soon that will require us to filter out dangerous viruses, but it's good to know that Tesla wants us breathing nice, clean air.